Best review of it I’ve seen. If you’re only going to read one, make it Snell’s. He covers it all: the great UI design, WebOS’s excellent card-based switching interface, the solid hardware, the shortcomings, what seems unfinished, WebOS’s seemingly endemic lagginess, and the miserable performance of Flash Player. The HP TouchPad has a case that’s easy to open and replaceable components. This tablet is built more like a PC than an iPad. First of all, the TouchPad is beautiful. It’s iPad beautiful. The case is glossy black plastic — a magnet for fingerprints, unfortunately, but it looks wicked great in the first five minutes. It supposedly has a blazing-fast chip inside, but you wouldn’t know it. When you rotate the screen, it takes the screen two seconds to match — an eternity in tablet time. Apps can take a long time to open; the built-in chat app, for example, takes seven seconds to appear. Animations are sometimes jerky, reactions to your finger swipes sometimes uncertain. Very strong consensus among all the reviews I’ve read. So is it safe to assume there will also be a Windows 8 tablet? A long pause. HP is the number-one seller of Windows PCs in the world, but they’re charting their own course in mobile with WebOS. They might even license WebOS to other hardware makers — whatever you think of the merits of that idea, there can be no argument that doing so would put HP in direct competition with Microsoft. 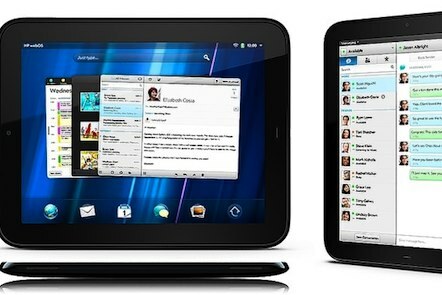 HP acknowledged Apple’s dominance in the tablet market, but said Apple wasn’t its target with the TouchPad. Restated for today, mobile OS competitors need to let go of the notion for them to succeed, Apple has to lose. Compare and contrast HP’s attitude with RIM’s.